Is There Any Help for My Stretch Marks? Feeling fed up with your stretch marks? Tired of hiding them with shorts or a skirt at the pool? Wish you didn’t have to feel self-conscious every time you look in the mirror? We get it! Stretch marks are a very frustrating but all too common problem that affects many women. Surprisingly, guys do get them too, but just not as often as the gals. Stretch marks (also known as striae) are often the result of pregnancy (one of few downsides! ), but they can also happen during perfectly normal growth and development of puberty for girls as well. Guys trying to bulk up in the gym can also get stretch marks, which kind of defeats the purpose of getting ripped. You want to show it off, not be worried about keeping it covered all the time! No matter who has them, no one likes stretch marks. And up until a few years ago, there really wasn’t much that could be done to treat them medically. Creams and solutions have been tried, but they really can’t get to the root of the problem. Now, lasers are being used to fight these embarrassing, ugly marks on the skin and doing a pretty good job of making them less noticeable. With laser treatment, you may be able to wear what you want again (or less if you want to too!). Celibre Medical Corporation has invested a lot of time and training into learning how to successfully treat unwanted stretch marks. We know how frustrating they are for you to have, and we have developed a laser treatment program that can help almost anyone suffering with stretch marks. Take if from us, they can be a very difficult and challenging problem to treat. There are many different types of stretch marks and not everyone responds exactly the same to treatment, so there really is a great deal of expertise needed to use lasers to treat them. But don’t worry, we are totally up to the challenge and well equipped with the latest, up-to-date technology to help you look and feel better about your body. Why Do I Get Stretch Marks and Why Do they Look So Bad? Chances are if you’re searching out information of the treatment of stretch marks, then you’ve only just recently developed them. They are those angry red, purple or brown stretch marks that look like streaks on the skin of your tummy, thighs, buttocks or breasts. If you’re a guy, you may have them on your chest, shoulders or arms. The main reason we get stretch marks is that our bodies grow faster than our skin can keep up with. This is usually the case with pregnancy, puberty and muscle mass. The parts of our skin that give it its flexibility are the collagen and elastin. When the skin can’t keep up, these parts get broken down. 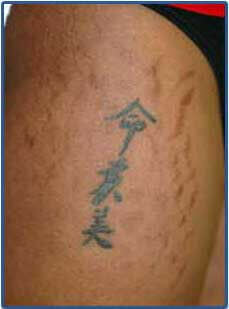 This is what leads to the skin texture changes with stretch marks, and is also why they appear indented in the skin. The redness comes from changes in vascularity or the amount of blood vessels in the skin in the area of a stretch mark. This usually is the case if you have a fair skin type. If your skin is darker, you may have an increase of melanin or skin pigment in the stretch mark, which makes it look dark or brown in color. The good news is that usually with time, stretch marks will fade. They can look like faint, silvery or white streaks many years after they initially occur. We understand that’s little comfort to you though if you’re dealing with them now and they’re affecting your self-esteem and life negatively. And while no one can really predict who will or won’t get stretch marks, there is a genetic component to them. So understand that there probably wasn’t much you could have done to prevent them. Also know that up to 90% of women get them at some point in their life, so you are definitely not suffering alone! How Can Laser Treatment Help Me Get Rid of my Stretch Marks? Like we said above, lots of creams, lotions and gels have been used to fight stretch marks. And while they may have mild success (at best), they really can’t get into the skin to the deeper layers where the collagen, elastin, pigment and blood vessels are which are the reasons they look the way they do. But guess what? Lasers can help with all of these things! Celibre Medical Corporation has a number of lasers that can be used to stimulate new collagen and elastin and help fade redness and dark discoloration. So if you have textured or colored stretch marks, anywhere on your body, old or new, chances are we have a laser treatment that can help you! Unfortunately, we do not have any treatments currently that can help with flat or white colored stretch marks. If you’ve wondered what can be done to help fade your stretch marks, and thought about seeking help, we are so glad you’ve found this page. Celibre Medical Corporation is a leader in laser treatment of this frustrating and difficult condition and we are here to help you. Please call to schedule your free consultation today. We would love to meet with you and discuss how our unique laser treatment plan can work for you!